This morning I received from my dear friend Ruth Schiffmann a super sweet award.She nominated me for Super Sweet Blogging Award. The rules are: 1. Answer the following five sweet questions 2. 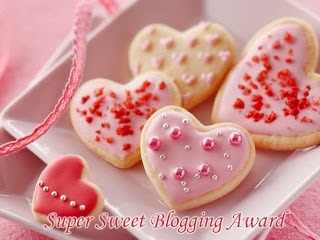 Nominate five sweet bloggers. 1. Cookies or Cake? : Too difficul to choose,but if I have I only can say I love cakes. Thank you so much. See my post tomorrow for a bigger thanks! ahhhrr congrats to you! and thank you for nominating me!